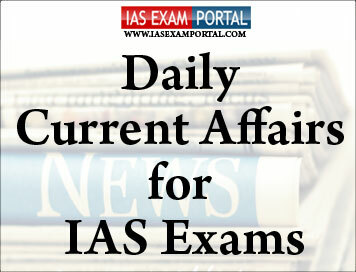 Current Affairs for IAS Exams - 3 September 2018 | IAS EXAM PORTAL - India's Largest Community for UPSC Exam Aspirants. The six Western Ghats States, including Kerala, have been restrained by the National Green Tribunal (NGT) from giving environmental clearance to activities that may adversely impact the eco-sensitive areas of the mountain ranges. The MadhavGadgil-led Western Ghats Ecology Expert Panel (WGEEP) report had created a political furore in the State with most of the political parties and a section of the church opposing it. The Tribunal Bench, in its order, noted that any alteration in the draft notification of zones may seriously affect the environment, especially in view of recent incidents in Kerala. It was on a petition filed by the Goa Foundation that the Bench issued the order. Pulling up the ghats States for the delay in filing objections regarding the notification, the tribunal observed that the “delay on account of objections of States may not be conducive to the protection of the eco-sensitive areas” and the matter must be finalised at the earliest. The WGEEP had earlier proposed “much larger areas for being included in the eco-sensitive zone” though the Kasturirangan-led High Level Working Group, also appointed by the MoEF and CC to look into the WGEEP report, had reduced it. The Ministry had accepted the Kasthurirangan report and issued the draft notifications on ecologically sensitive zones. At the 2+2 dialogue between India and the U.S. here on September 6, an announcement could be made about an in-principle agreement between the two sides on the Communications Compatibility and Security Agreement (COMCASA), but its signing is doubtful, say officials on both sides. While the contours of the agreement have been agreed upon, last-minute deliberations are under way to address specific concerns in the language. “As of now, it is difficult to say if it would be signed during the 2+2,” another official said. Diplomatic sources, too, while expressing the hope that the agreement would be signed, said realistically it was not clear yet. This is a similar trajectory followed when India signed the Logistics Exchange Memorandum of Understanding. The COMCASA will facilitate exchange of secure communications between the two militaries and allow the sale of encrypted communication systems to India. For a long time there have been concerns that this would allow the U.S. to listen into Indian secure communication channels. But these have been gradually overcome and India agreed to move forward with the agreement. Mauritius remained the top source of foreign direct investment (FDI) into India in 2017-18 followed by Singapore, whereas total FDI stood at $37.36 billion in the financial year, a marginal rise over the $36.31 billion recorded in the previous fiscal, according to RBI data. While FDI from Mauritius totalled $13.41 billion as against $13.38 billion in the previous year, inflows from Singapore rose to $9.27 billion from $6.52 billion. FDI from the Netherlands declined marginally to $2.67 billion as against $3.23 billion a year earlier. Provisional data for the fiscal ended March revealed that FDI into the manufacturing sector witnessed a substantial decline to $7.06 billion, as against $11.97 billion a year earlier. However, FDI into communication services rose to $8.8 billion in FY18 from $5.8 billion. The inflows into retail and wholesale trade also shot up to $4.47 billion as against $2.77 billion, while financial services too saw a rise to $4.07 billion from $3.73 billion in the previous year. “The fact that these sectors accounted for more than 50% of total FDI of $37.36 billion in 2017-18 reflects the global interest in new areas, including online marketplaces and financial technologies,” said Assocham in a statement. Canara Bank, the nodal bank, has opened the portal for claiming interest subsidy on education loan for financial year 2017-18 from September 1, 2018. It will be open till September 28. The Central sector interest subsidy (CSIS) scheme was implemented by the Union Ministry of Human Resource Development. Under this scheme, full interest subsidy is provided for the moratorium period (course period plus one year) on the education loan up to Rs. 7.5 lakh taken from scheduled banks. The benefits are applicable to students from economically weaker sections (EWS), having a parental income of up to Rs. 4.5 lakh per annum. Tamil Nadu is one of the top States in availing education loans. Education loans up to Rs. 1,932.82 crore were disbursed in 2017-18 , compared to Rs. 1,832.24 crore in 2016-17, according to the data from the Reserve Bank of India. According to K. Srinivasan, Convenor, Education Loan Task Force (ELTF), as per guidelines, branch managers have to identify eligible student borrowers and submit the claim for the interest subsidy for FY 2017-18 through the Canara Bank portal. “Though it is the responsibility of the branch managers to submit the claim, in their own interest, students are advised to ensure that the branches submit the claim within the stipulated date,” he added. A year since nearly a million Rohingya refugees poured into Bangladesh, the situation is yet to stabilize, and the impending cyclone season could spell disaster for the humanitarian effort, a senior United Nations official based in Cox’s Bazaar has warned. “Even to the naked eye it is clear that we are not just on the brink of disaster, but the disaster is happening around us,” said SumbulRizvi, the senior humanitarian coordinator for the Rohingya Refugee Response, making an appeal for more international funding. This year’s UN joint response plan (JRP) has received only 34% of the funds needed, in contrast to about 85% last year, she said. Amidst signs of the flagging global response to the crisis, UN Secretary General Antonio Guterres addressed the Security Council on the situation on the ground this week, while a Human Rights Council report said the Myanmar military leadership should be investigated for “genocide” in the violence in August 2017. The government has established several police stations and more than 70 senior administration officials who lead the response including the law and order situation. There is need to ensure the young boys and girls in the camps must be given access to education. Their complete dependency on food aid, and the lack of a livelihood which in the natural process, would help the community deal with their trauma. The U.S. military plans to cancel $300 million in aid to Pakistan due to Islamabad’s lack of “decisive actions” in support of American strategy in the region, the Pentagon said on Saturday. The U.S. has been pushing Pakistan to crack down on militant safe havens in the country, and announced a freeze on aid at the beginning of the year that an official said could be worth almost $2 billion. The Defense Department has sought to cut aid by $300 million “due to a lack of Pakistani decisive actions in support of the South Asia Strategy”, Lieutenant Colonel Kone Faulkner said. “We continue to press Pakistan to indiscriminately target all terrorist groups,” Mr. Faulkner said, adding that the latest aid cut request was pending Congressional approval. Pakistan has fought fierce campaigns against home-grown militant groups, and says it has lost thousands of lives and spent billions of dollars in its long war on extremism. But U.S. officials accuse Islamabad of ignoring or even collaborating with groups, which attack Afghanistan from safe havens along the border between the two countries. The White House believes that Pakistan’s Inter-Services Intelligence agency and other military bodies have long helped fund and arm the Taliban for ideological reasons, but also to counter rising Indian influence in Afghanistan. It also believes that a Pakistani crackdown could be pivotal in deciding the outcome of the long-running war in Afghanistan. Pakistan’s new Prime Minister Imran Khan has repeatedly blamed Islamabad’s participation in the U.S.-led anti-terror campaign for the surge in terrorism on home soil over the last decade and has vowed to rebalance Islamabad's relationship with Washington. Sea surface temperature (SST) is routinely used for predicting whether the total amount of rainfall that India receives during the monsoon season will be less or more than the long-term mean of 887.5 mm. Now, scientists from Pune’s Indian Institute of Tropical Meteorology (IITM) find that ocean mean temperature (OMT) that has better ability to predict this than the sea surface temperature. Compared with SST which has 60% success rate of predicting the Indian summer monsoon, OMT has 80% success rate. “The heat content of the upper ocean creates more impact on monsoon than sea surface temperature, which is restricted to the skin of the ocean,” says M. Rajeevan, Secretary, Ministry of Earth Sciences and one of the authors of the paper. In addition, SST also exhibits large temperature fluctuations compared with OMT of the upper layer, leading to more noise that causes lower correlations with summer monsoon rainfall. “The ocean mean temperature variations are more stable and consistent and have lower spatial and temporal spread. So OMT has better summer monsoon predictability than SST,” says Dr. Ali. The reason why OMT performs better than SST is because OMT better represents the upper ocean thermal energy conditions. And the variations in the upper ocean thermal energy conditions are mainly responsible for the summer monsoon. “When there is rapid heating or cooling, the temperature of the top ocean layer will be significantly different from the upper ocean thermal energy, resulting in misleading monsoon predictions,” says Dr. Ali. Mild steel used in a wide range of industries easily develops rust and the corrosion causes huge economic loss every year. As chemical corrosion inhibitors are detrimental to the environment, there is an urgent need to develop green inhibitors. Now, researchers from Indian Institute of Technology (BHU), Varanasi, have successfully produced a chitosan-based corrosion inhibitor that shows over 90% efficiency. “As the solubility of chitosan in water is poor, polyethylene glycol (PEG) was incorporated to it and a novel PEG-crosslinked chitosan was developed. PEG is non-toxic and has been approved by the FDA even for internal consumption. Mild steel was immersed in a corrosion-inducing solution of hydrochloric acid containing different concentration of chitosan-PEG ranging from 50-200 mg/L for six hours. The novel inhibitor was found to form a thin film on the metal surface. “Usually when steel is treated with anti-corrosive agents there is a change in its surface and it tends to get rough. But our inhibitor did not alter the surface. In fact, there was a significant improvement in the surface smoothness,” Prof. Quraishi adds. The country may be desperately waiting for its first Olympic medal but federation chief AdilleSumariwalla feels that India is now a superpower in athletics. Success in any sport is measured by how athletes perform at the Olympics and the AFI President has now chalked out a plan to succeed on the big stage. “We have submitted our plans for the Olympics to the Government, our target events have all been given to them confidentially.”saysSumariwalla. He also made it clear that the AFI would continue with its rule that non-campers would not be included in the relay team despite many athletes going to various courts challenging it.“Almost all our athletes have fought in the final, except the walkers who got disqualified and we are looking at that more closely”he said.